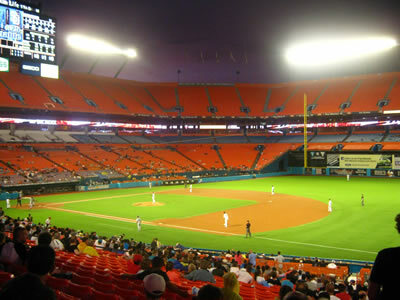 There doesn't seem to be any public transportation to get to Sun Life Stadium (-1). If there is then it is tough to find. There is a lot of parking around the stadium (+1) even if the toll system will eat up your singles on the drive there (-1). The parking is reasonable (+1), though, and you can even park at the Wal-Mart across from the stadium if you're up for a little walk (+1) and aren't worried about a potential tow. The stadium parking doesn't open all of the lots at once so it can sometimes be difficult to find where you're allowed to park. The ticket prices are incredibly reasonable (+1), especially for Miami. While no seat prices reach the single digits there are some pretty cheap ones available (+1). The upper deck is not opened for regular season games so the seats that are available are all pretty close to the field (+1) and, surprisingly, even though it is a football stadium there isn't much foul territory. You aren't as close to the field as you are at stadiums like Wrigley and PNC (-1), but it isn't bad. 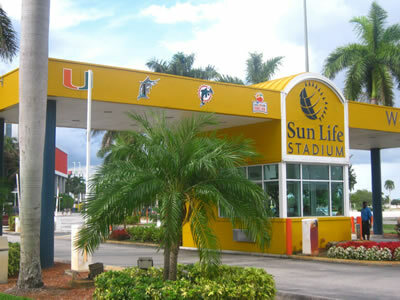 The exterior of the stadium reminds you that it's a football stadium first since there are few indications that the Marlins play at Sun Life from the outside other than some flags (-1). The team has won the World Series twice since they were founded, but there was no indication of that on the outside (-1). The 80's-era colors are befitting Miami (+1), but the color scheme still reminds you that the Dolphins play there. 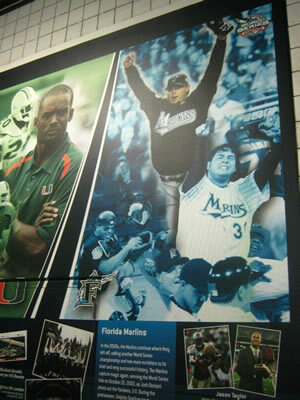 There are a few murals around the stadium that highlight the past of the Marlins (+1), but they tend to focus more on the Dolphins and University of Miami (-1). The inside of the stadium isn't very unique (-1) other than a covered-up jacuzzi in the outfield (+1). The stadium also suffers from the same plight as other football stadium such as Oakland's in that the entire upper deck is covered by a tarp (-1). Not a good look for a stadium, but necessary since the fans couldn't even come close to filling the lower decks. The HD scoreboard shows a lot of information (+1) and replaced the stadium's old scoreboard in 2006. The out-of-town scores are shown (+1) periodically on LED ribbons around the stadium so they can be tough to catch (-1). There is also no classic touch to the scoreboard (-1), which isn't surprising given it is a football stadium. While the stadium doesn't have a playground like some modern stadiums (-1), it does have a number of games for kids such as batting cages (+1). The kids can win prizes at these games (+1), and the best part is they are all free (+2)! I was going to give the fans a little leeway because the game we went to was in the middle of the week on a rain-threatened night (+1), but from what I've read the game we went to was typical (-1). The stadium was even more empty than the game we went to in Oakland (-1), and the fans didn't even get into the game when the scoreboard encouraged them to (-1). 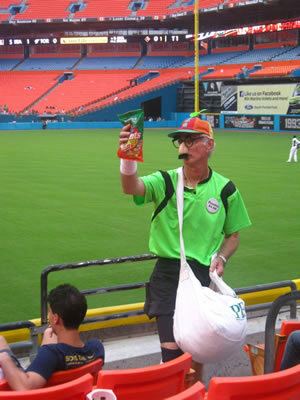 Hopefully a new stadium will get more fans out to games, but the fans certainly didn't care for Marlins games at Sun Life. The ushers are almost nonexistent (-1), but the good part about that is you can sit where ever you want (+2). Trading up is easier at Sun Life than any other stadium (+2). The fans actually got into "Take Me Out" (+2) and afterwards they played "Shout," (+1) which is fitting for Miami's party atmosphere (+2). Other than a Wal-Mart (-1) there is nothing to do around Sun Life Stadium (-1), and even the Wal-Mart seemed a little shady (-1). You're better off paying the tolls (-1) to head down to South Beach (+1).